Have you ever had the problem of having to balance your mobile phone when you had too many things in your hand? With all the gadgets lug around these days, I suppose that that isn’t such an uncommon situation. I cannot even count the number of times that I’ve had to juggle stuff when my phone rings and I am out in the mall or somewhere else. During those times, don’t you just wish that you had a way to hold your phone easily? That’s exactly what Trevor Prideaux wanted, and he got it, too. The British guy’s situation is rather different and unique, though. He was born without his left arm and has had to live his life in this condition. He did, however, get a prosthetic arm. As can be expected, he has been having problems holding his mobile phone and using it. His solution? Have a dock built into his prosthetic arm! You have to admit that it is a brilliant idea, and it came to him while testing the iPhone. In order to see if his idea would work, he contacted Apple to see if they would help him out by sending him a blank iPhone casing. Unfortunately, Apple didn’t want to cooperate in the matter. That didn’t stop Prideaux, and when he got a new Nokia C7, he approached the manufacturer to see if they could help him. 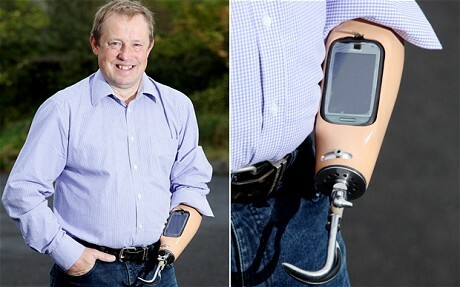 To make the long story short, Nokia agreed to lend a hand, and together with the technicians at the Exeter Mobility Centre, a new prosthetic arm with a built-in phone dock. Today, Prideaux is proud and happy to have a one-of-a-kind prosthetic limb, which makes his life so much easier. He says that he just needs to hold up his arm to make (or answer) a call or even put it on speaker phone – without having to struggle with holding it. He also looks beyond his own needs and is excited about other people in the same situation being able to use the technology. It’s one of those things that make one really appreciate what technology can do, isn’t it?